In an "open letter" to PhRMA CEO, John Castellani, Forbes Blogger and former president of Pfizer Global Research, John LaMattina, offers several suggestions for improving the reputation of the pharmaceutical industry. You can read the "letter" here. Unfortunately, IMHO, the "train has already left the station" as they say. In fact, the train has crashed! You might recall that LaMattina famously called for the end of DTC (direct-to-consumer) advertising in his book, Devalued and Distrusted (see "Bad, Devalued, Distrusted & Defensive Pharma: A Tale of Two Books"). In his open letter, however, LaMattina focuses on the R&D side of the pharma enterprise. Specifically, he calls upon PhRMA to "put more of a human face on the R&D process." "Why not put together a group of PhRMA scientists who were key members of the teams that produced these [newly FDA-approved] drugs?," LaMattina asks. "Then, pair them up with patients who have personally benefited from these breakthroughs and ask that they give talks or meet with the media in cities throughout the U.S. I have found that, while many members of the pharma industry are viewed with skepticism, scientists still have a good deal of credibility." That's a good idea. In fact, I suggested almost the same thing repeatedly as far back as 2007 and earlier when that train was still in the station. In a 2007 post to this blog, I said: "God bless the dedicated researchers and scientists of the pharmaceutical industry! They are truly the unsung heroes of the pharmaceutical industry! Too bad they are sequestered in their labs!' (see "God Bless R&D, but Marketers May Go to Hell!"). The "guys" in the labs are "isolated from public view, locked away in cages like lab rats!," I said. "And that's a problem I have always railed against. Time and again, I point out to any industry executive who will listen: give these people a voice!. Instead, the industry gives sales reps a voice among the public (see, for example, the section "Clarence," GSK's R&D Guy, Trumps "Jamie," Pfizer Viagra Guy! in this 2006 post: "GSK's 'Plain Talk' Flawed"). 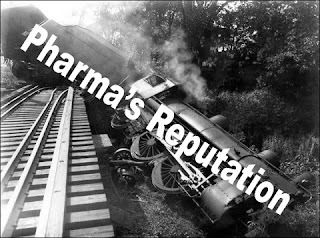 But that train may have left the station and crashed in 2008 when the "dark side" of pharma's R&D leaders was exposed (see "Pharma R&D Succumbs to the Dark Side"). R&D is succumbing to the demands of the commercial side of pharma. I said, "It's not quite under the thumb of the dark side, but it's tainted, which is one conclusion I came to after reading the EHNANCE story" (op cit). LaMattina also addresses the issue of "clinical trial transparency" in his open letter. Lack of transparency about negative clinical trial data is another, more recent, manifestation of the "dark side" of pharma R&D. Dr. Ben Goldacre, author of Bad Pharma, has written and lectured extensively about this (see "Bad, Devalued, Distrusted & Defensive Pharma: A Tale of Two Books"). On this issue, LaMattina recommends that all pharma companies follow GSK's lead and make all clinical trial data available for 3rd-party analysis. Recently, Roche agreed to release all of the trial data for its controversial influenza drug Tamiflu to the Cochrane Collaboration (see here). Roche did this kicking and screaming and may have put limits on the data revealed. To the public, this sounds like "too little, too late"; i.e., another way of saying "the train has already left the station."